Late yesterday afternoon, we talked to Senator Roy Blunt’s office who confirmed that Blunt is open to banning bump-fire stocks if the bill hits the floor! But staff in our office spoke with Melanie in the Kansas City office, as well as additional staffers in the D.C. office, who both confirmed Blunt’s position on this issue. I don’t know about you, but this is simply unacceptable! I’ll give you the contact info for Senator Blunt and I hope that you’ll contact him right away. More on that in a moment. Some gun owners may be confused about what’s really going on in Washington D.C. right now, with HR 3999 being introduced last week. Let me remind you once again, this bill, while purporting to be about ‘bump fire stocks,’ is about much more. It’s the worst kept secret in D.C. that this bill is simply a Trojan Horse — an attempt to get a foot in the door — to pass through something larger. That’s why it’s essential that pro-gun legislators in D.C. remain absolutely steadfast and fight tooth and nail to oppose any attempt at gun control, be that legislative or administrative. We simply can’t give an inch. That’s why I need you to contact Senator Blunt’s office right now, and demand that he withdraw his support for a bump-fire ban immediately! >>> Emailing him by clicking on this link. Don’t be surprised to hear a bunch of double-talk from Blunt’s office. What kind of swamp are these staffers swimming in? Senator Blunt either stands with gun owners in opposing any attempt to clamp down on our Second Amendment rights, or he doesn’t. And don’t fall for the other ruse his office tried to use on us, which is that Senator Blunt opposes gun control, but supports regulatory changes via the ATF to ban these accessories. That’s an obvious ploy to have his cake and be able to eat it too, by allowing him to have the same effect of passing a gun control bill while not having to go on the record. HELP MOFC STAY ON THE FRONT LINES! EVERY DOLLAR YOU DONATE STAYS RIGHT HERE IN MISSOURI TO FIGHT FOR OUR SECOND AMENDMENT FREEDOMS! JOIN TODAY! Gun control — whether foisted on us through the legislative process or administrative process — needs to be seen for what it is and opposed by every gun owner in Missouri! The longer our ‘allies’ talk about giving in to the Feinstein/Pelosi gun-control bill, we are losing momentum on any chance of passing pro-gun legislation in D.C. So please contact Senator Blunt and insist that he reverse his course, and stand tall for gun owners by opposing any gun control of any kind! And please make an emergency contribution to enable the Missouri Firearms Coalition to continue getting the word out to gun owners! While our fight to advance gun rights is more visible during the legislative session, the work that we do goes on year round — and we need your help. Whatever you do, please contact Senator Blunt’s office right away! P.S. 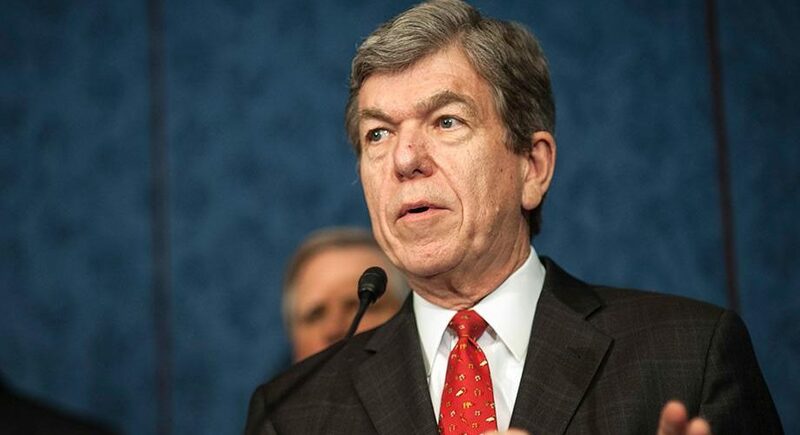 Earlier today, Senator Roy Blunt’s office in Kansas City and D.C. confirmed that Blunt is ‘open to banning bump-fire stocks’ as he concedes the ground to the radical gun-control crowd in D.C..
Of course, as gun owners all know, this bill in D.C. has little to do with ‘bump fire stocks’ and everything to do with anti-gun legislators trying to condition pro-gun legislators to give ground after every mass shooting incident. We can’t give an inch! Please contact Senator Blunt’s office immediately — using the information provided above — and insist that he oppose gun-control of any kind in D.C.! And when you’re through, please help the Missouri Firearms Coalition stay active on the front lines, by making an donation today!